Shaky Kane's Monster Truck Average 0.00/5 - out of 0 total votes. GET YOUR MOTOR ROLLING AND HEAD OUT ALONG COMIC BOOK ROUTE 666! 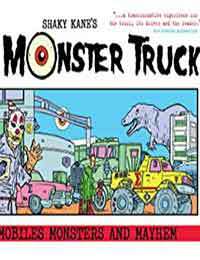 Taking it's stylistic cues from the silver age of comics, this graphic road movie by comics legend SHAKY KANE, pans out over 50 continuous panels, taking the reader on a hallucinogenic journey into the very hinterland of popular culture. Deluxe, recolored, remastered second printing of the WISHBONE STUDIO cult classic. "The world in a blender, all the tastiest parts shaken, rattled, and rolled into a Technicolor mind-warp!" Matt Seneca, Death To The Universe.